Tucked seamlessly in to the skyline of bustling Southwest Portland, Oregon, lies the newly renovated Jeld-Wen Field. Formerly PGE Park, the recently unveiled Jeld-Wen Field is home to the Portland Timbers soccer club. The Timbers, previously members of the USL and USSF, were announced as Major League Soccer’s (MLS) 18th club in 2009 and began MLS play in 2011. A Portland tradition since 2001, the Timbers and their supporters are proud to bring MLS soccer to the Rose City. A move up to the MLS will allow the Timbers to continue the Portland-Seattle Rivalry with the Seattle Sounders FC. While The Vancouver White Caps FC will also make their MLS debut in 2011. Thus Timbers fans while have two familiar rivals to welcome in to their $31millon dollar newly refurbished facility. Alaska Airlines is one of the Timbers primary sponsors and their logo is predominately displayed on the Timbers home and away jerseys. Already steeped in athletic and entertainment lore, Jeld-Wen Field received a renovation that has made it one of the most intimate and exciting soccer facilities in the United States. The functionality of the venue, as well as the new amenities, guarantee that Jeld-Wen Field will enhance the MLS experience for Northwest soccer fans of all ages. The 96,000 feet of new playing surface has been installed and shifted to the west and the north of the previous configuration. This change has provided an exciting “closer to the action feel” and has allowed for an approximate 5,000 new seats to be installed. This brings the seating capacity of Jeld-Wen up to 22,000. These new seats will have industry-leading leg room and width, with a majority of the new seats covered by a new roof, shielding fans from the liquid sunshine for which Portland is famous. A brand new, extended public plaza and a new 1,000 square foot Adidas Team store headline the amenities offered at this new state of the art facility. However, the crown jewel of the revamped fan experience is Jeld-Wen field’s new KeyBank Club. The 5,200 square foot KeyBank Club was built to service the 1,144 midfield club seats, and provides a unique dining experience to the fans. With private entrances, and field views throughout, the KeyBank Club is the ideal place to hold a meeting, private party, or social event. 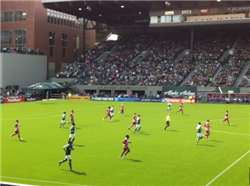 Jeld-Wen Field is located in the heart of southwest Portland. The stadium sits on a rectangular block bounded by Southwest Morrison Street, Southwest 18th Avenue, the Multnomah Athletic building and Southwest Salmon Street, and Southwest 20th Avenue. It has easy access to both Interstate 405, or the “Stadium Freeway,” and the PGE Park MAX light Rail station, which is located directly across the street. The stadium’s central location makes it a great place to start, or finish, a day of exploration in Portland. With tremendous shopping, arts, and lounges nearby, one might forget to stop in to one of the exquisite eateries all within walking distance of stadium. Plainfield’s, Elephants delicatessen, and The Ringside Steakhouse are all located less than a half mile from the Jeld-Wen Entrance.